Originally from Appalachia, AshleyRose Sullivan lives in Los Angeles with her husband and their many imaginary friends. Her work has been published in places like The Rumpus, Barrelhouse, and Monkey Bicycle and her novels, Awesome Jones: A Superhero Fairy Tale and Silver Tongue are available from Seventh Star Press. 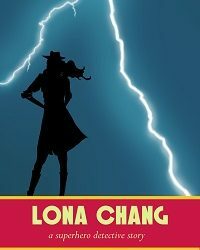 Lona Chang is a secretary in a print shop, but she’s also a budding superhero and an amateur detective. Her partner – in love and and saving people – is Awesome Jones, also a superhero, but a normal guy, as well. Together they fight crime. Okay, this book is more than that. In concept Lona Chang and it’s predecessor are comicbooks (Stan Lee insists that it should be one word, and I refuse to argue with him on a such a topic) in novel form, but they’re also a bit more complex than an actual comic, because in a novel there’s time to dig into people’s inner monologues and really explore the details of a world. Author AshleyRose (also one word) Sullivan has given us a fairy tale for adults, one rich with characters and backstories and interconnected relationships, as well as diametrically opposed goals and desires. She’s given us a compelling mystery and two people who are ordinary people on the surface, until they let their extraordinary selves take over. The writing style is contemporary and upbeat, riding the blurred edge between sophisticated Young Adult/New Adult fare and general fiction. The dialogue is snappy and believable. The world of Arc City is as vivid as Gotham, Star City, or Metropolis ever were, and the plot is well-paced, and truly interesting. From opening to ending, I was hooked on this story. 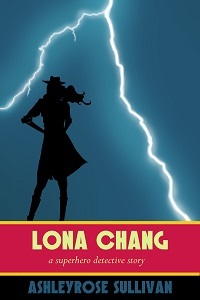 While I enjoyed Lona Chang as a stand-alone (I’m pretty good at extrapolating things from context) there are a lot of relationships and details that are better understood if you read Awesome Jones first. This review was actually rescheduled so I could have time to go back and read the first novel, and I’m not sorry. Both books are enjoyable, but the second is so much better after having read the first. If you (like me) used to tie your hoodie over your head and let the rest of it flow free so you could have a cape, or if you tucked a beach towel into the collar of your t-shirt (also as a cape) – if you have perfected your delivery of the phrase “I’m Batman” – if last summers Wonder Woman movie made you cry, you will love Lona Chang and Awesome Jones – the characters, and their stories. Goes well with a hot dog and a Coke, purchased from a street vendor and – hey! Did you see someone WOOSH by just now?